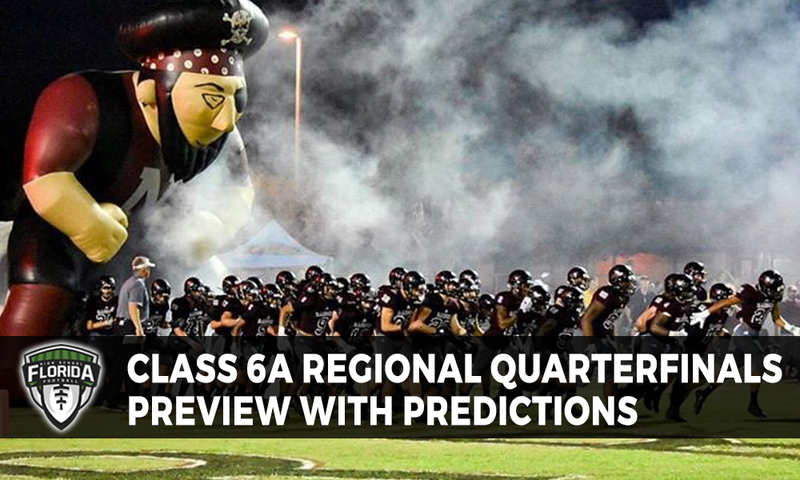 The regional quarterfinals open up Friday night in Class 6A and there is a good slate of games to keep an eye on as the Drive To December gets going. All game scheduled for Friday, November 9 with a 7:30 p.m. Eastern kickoff unless noted. CLASS 6A-REGION 2: No. 5 Gainesville (7-3) at No. 4 Lake Wales (9-1): Gainesville comes into this game playing having played one of the toughest schedules of any team in Region 2 while Lake Wales rides into this with a nine-game win streak and in the playoffs after just missing out on things last year. The Hurricanes will be led by senior quarterback Luke Matthews (184-251 passing, 2,455 yards, 21 TDs, 9 INTs) with Jalen Kelsey (55 receptions, 994 yards, 8 TDs) being one of his favorite targets. However, some balance will be found with Niles Cromwell (85 carries, 866 yards, 13 TDs) coming out of the backfield. For the host Highlanders, keep an eye on quarterback Chayli Garnett (117-188 passing, 1,928 yards, 18 TD, 4 INTs) along with a great rushing attack from Johnny Richardson (148 carries, 1,186 yards, 15 TDs) to carry the offense. Don’t be surprised if this game turns into a barnburner like a few of the games Lake Wales has been put through this season already. CLASS 6A-REGION 3: No. 5 Barron Collier (7-3) at No. 4 Fort Myers (8-2): This is about as good as it gets when it comes to a South Florida playoff game. Two teams that are battle tested and well coached and this will have the makings to be one of the most talked about games of the first-round slate. The visiting Cougars will have the balance playmaking abilities of quarterback Jason Grimes (81-121 passing, 1,113 yards, 13 TDs, 4 INTs) and running back Drew Powell (184 carries, 1,273 yards, 13 TDs) to help attack things against the host Green Wave defense. Speaking of the Green Wave, watch out for dual-threat quarterback Willie Neal (67-116, 1,076 yards, 11 TDs, 2 INTs; 82 carries, 473 yards, 6 TDs rushing) to lead the offense through the Barron Collier defense as well as running back Yasias Young (99 carries, 676 yards, 9 TDs). Overall, this will be a very competitive and potentially tight ball game where mistakes could be costly when the final whistle blows. CLASS 6A-REGION 4: No. 6 Miami Northwestern (5-5) at No. 3 Mainland (7-3): The defending Class 6A state champions are on the road to start their title defense in Daytona Beach after going through some struggles this season including going an even .500 on the regular season. For the visiting Bulls they are going to need defense to keep them in the game and they will have linebacker Samuel Brooks who has been one of the major forces of that Bulls defense to lead the way. For the host Buccaneers, keep an eye on running back D’Andre McMillian who has rushed for 1,000 yards this season, but will be relying on its defense to say in this game against the Bulls.